At Trial Pro in Orlando, Florida, the attorneys in our law firm possess a passion for obtaining the maximum compensation possible for our personal injury clients. Our illustrious track record of successes assures our clients from all over Central Florida that we are the law firm of choice when it comes to personal injury representation. In addition, we maintain offices not only in Orlando, but also in Fort Myers, Naples, and by appointment in Jacksonville, Daytona Beach, Miami and Delray Beach. We are well aware, however, that oftentimes our clients have sustained serious injuries that make it impossible for them to come to our offices for their free consultations. In such situations, we are more than happy to go to them, whether it be to their hospital room, their doctor's office, their home or anywhere else they feel most comfortable. In addition, we represent grieving families who have lost a loved one to wrongful death. The attorneys and staff at our law firm dedicate themselves to our clients, giving them our undivided attention, our best efforts and our commitment to obtain the highest possible settlement or jury award. 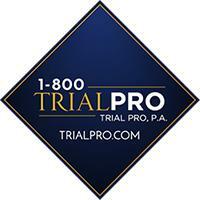 As we like to say, we aren't just attorneys -- we are Trial Pro!